Ah, the sport of kings! That's horse racing. 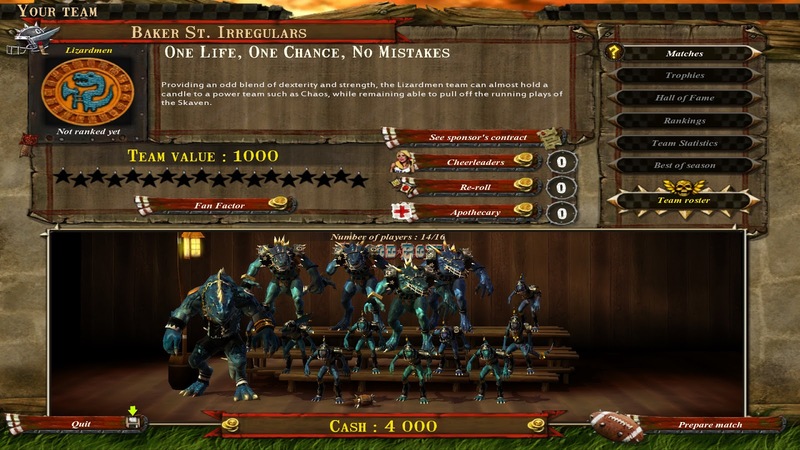 Blood Bowl on the other hand is a turn-based sport board game set in the Warhammer universe. It's kind of like American football but with the flow and excitement removed and fantasy clichés and random dice rolls added. Let's see how my team-The Baker Street Irregulars-got on in their first season in the top flight. When it was a board game I never really saw the appeal of Blood Bowl. Warhammer 40,000 on the other hand was right up my street. I was mainly into the painting of the miniatures and the fantasy era stuff all looked very brown. No equivalent of the bold flat colours of the Eldar there, just skin and leather and hair. I wasn't really into sport either so I quickly disregarded it. In the last few years or so though I've had a bit of a revelation about sport and I've started regularly playing and watching it. My sport of choice to play is Ultimate Frisbee which shares many similarities with American football (and thus Blood Bowl). 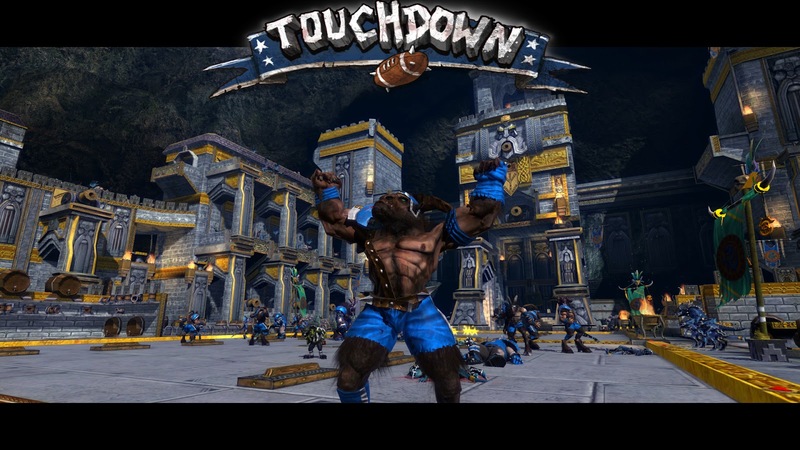 It's a game about maintaining possession, managing space, strategic passing and scoring in the endzone. I love it because it suits a lanky person like me and because it's the first game I've ever taken the time to learn the tactics of. Now that I've had this revelation, a turn-based sports game, with all the physical aspects removed and nothing but the strategy, should be perfect for me. I throw myself into things, as is our remit, and go straight into a tournament on the hardest difficulty. I don't know the rules, I don't know the positions, I don't know the buffs and I don't know how high a stat has to be to be good, so tactically I'm completely blind here. 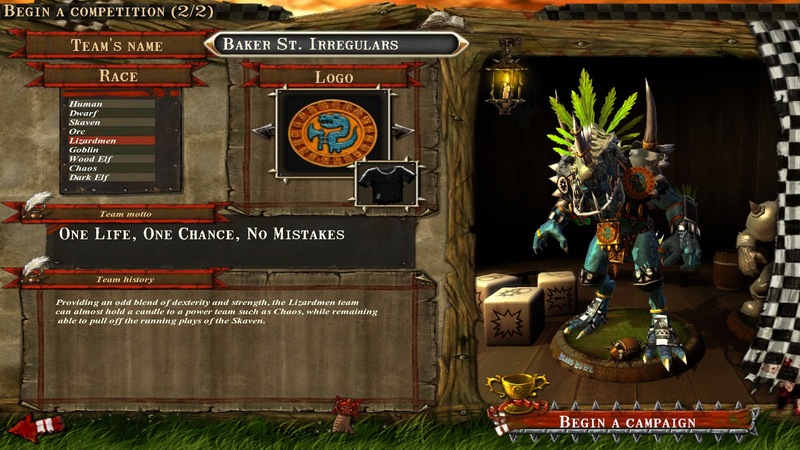 I choose the Lizardmen because they blend Strength and Dexterity. Unfortunately they blend it into an undercooked poo pie, but I won't find that out until later. He looks formidable doesn't he? It'll be a walkover surely. Then I'm told I don't have any players and I have to buy some. I have plenty of money, but I don't know how many players there are in a team. I have 16 spaces but I assume that's my squad and that I'll actually field less. I buy the one massive lizard beast I'm allowed, 6 or 7 rough looking chaps and fill the rest of the spaces with nippy little runners. That should give me the flexibility I need, but I think I'll mainly be relying on speed and dexterity from my little chaps. With no money left for everything else you're supposed to do but I had no idea was coming, I head to the pitch to see what I can do. I mirror my opponent's set up with my blockers in the middle and my runners set up behind them. The kick goes up and I think I catch it and something happens and I'm not sure what and I try and punch a player and a dice noise plays and it's a turnover. This is when I remember the giant gaping flaw in Blood Bowl. Let's look at what's happened as if we're playing the game ourselves. I have the ball, I'm nippy and can throw, but I need the protection of a big Northern brute like Neil to help keep the big boys off me. Ben's helping him out, trying to block people from getting to me. I move deftly up the left wing and Neil drops in between me and the approaching opposition players. Ben sees someone who we think will cause us some issues so he runs up and tries to block him from getting to us. He fails (turns out it was a beer belly not a six-pack) and gets knocked down. In any real sport I would now have a few choices - I could trust that Neil can handle him and continue with our charge up the wing, I could just make a run for it and rely on my dexterity, or I could pass it to one of the many other open players on the field who could begin their own move. My choice in Blood Bowl is zero. Now that one of our players has failed a dice roll it's the opposing teams turn and we can't move until they fail one. Just because Ben got knocked down, we have to stand there like lemons. It's ridiculous, how can you plan a strategy when one failed dice roll blows it apart? You can't have a single piece of your plan fail without completely giving up control. They storm into the endzone and score while the rest of my team just stand around bleeding. I'll have to go for speed if I'm to score, I just cant risk failing a knockdown roll. Not the end of the world, we've all seen comebacks and I think I've got the idea now. I catch the ball and pass it out to my designated runner. He heads to hug the right touchline and 3 blockers move between him and any opponents. My other blockers mark the open space ready to pick up any runners who try to get behind me.I've left a clear gap up and down the line so I can throw to the endzone or back to a safe position and reset. No dice rolls are failed so far. Once all my players have moved it's the opponent's turn. They push in to my half and out towards my ball carrier. This is fine, the space they've left is open for my other runners if I need them. One of their brutes approaches my Lizardman blocker and, joy of joys, fails his roll and gets taken out. It's a turnover and my guys are off. My ball carrier and wall head further up the touchline and my runners assume positions where they can flood the endzone if necessary. I risk a run from one of my nippy fellas and he gets safely deep into their half. So I have my options now and it's decision time: attempt to run my ball-carrier into the endzone, throw to my free receiver who can run in and score or dump it back and reset. My two point scoring opportunities involve dice rolls, one to see if my throw clears the defender, and the other to see if I dodge the defender's tackle. The defender in both cases is the same guy. I have three blockers available to pummel him, but because of the turnover rule I'm frozen with fear. All of my options are good but I have no idea if I'm more likely to pass a dodge, a throw or a knockdown roll. In the end I try and bash him and fail my roll. I should be able to try that twice more since I've made sure to move in a group, but no, it's a turnover and one by one my team get pummelled and it's 3-0 and the final whistle blows. I feel a little aggrieved at having what I thought was a well thought out strategy spoiled by a dice roll, but I did feel like I was making progress and I'll probably do better if I ever go back to it. 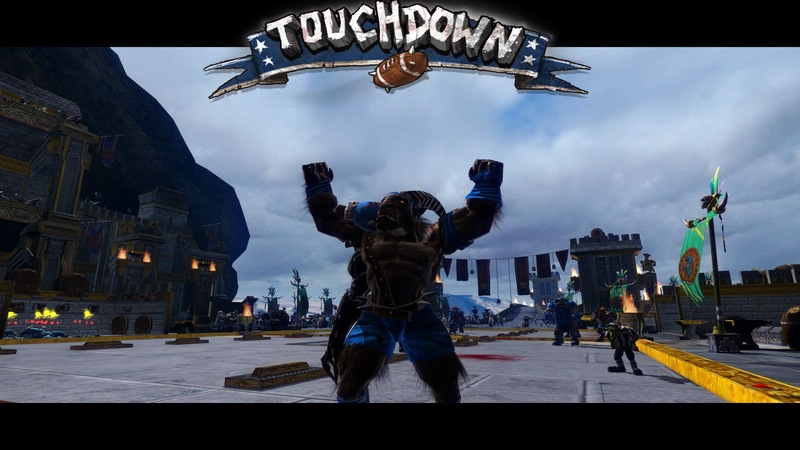 Overall I think I would enjoy Blood Bowl if I started on easy and gave it a few more tries. Maybe we need to start a league at work. Surely it is pizzas eaten 1/2, or did i not get any? 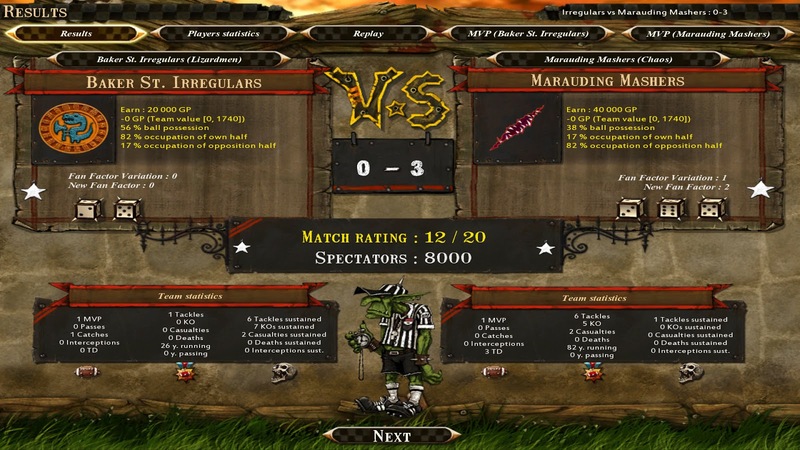 Also you have in no way convinced me to play Bloodbowl. I still have no idea what it is.